The Sheriff Centre, St James Church. 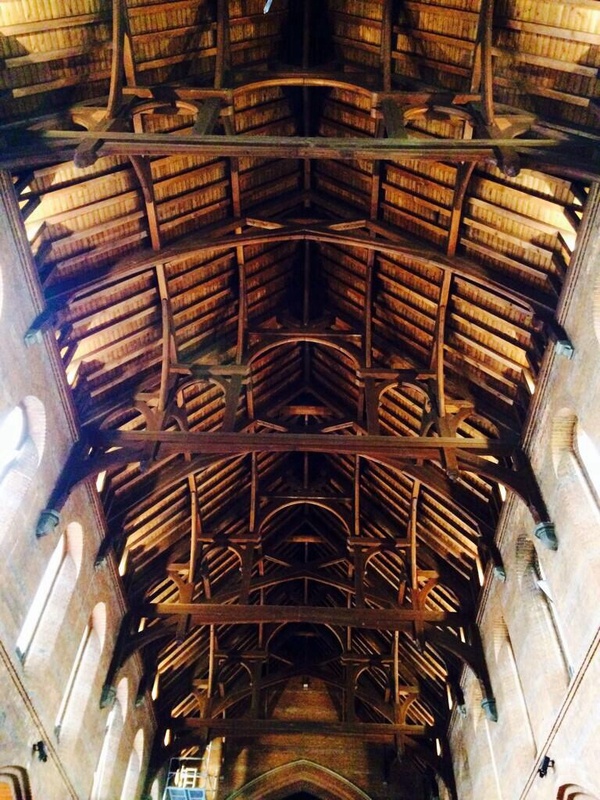 Hello and welcome to the blog for The Sheriff Centre, West Hampstead. 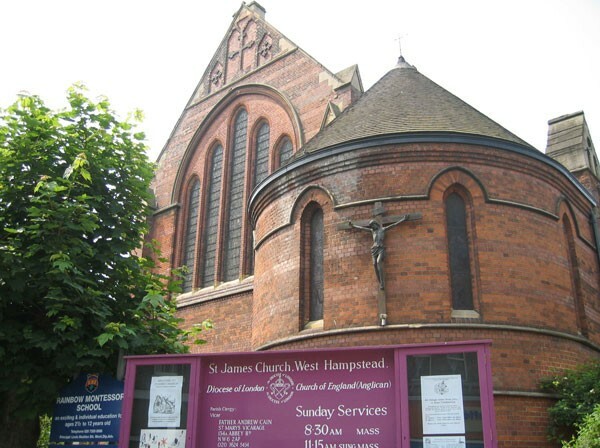 This is a very exciting project for West Hampstead and here you can find out what it’s all about, get a bit of background to how it all started and keep up to date with how it’s progressing. We welcome your comments and feedback so please get involved! Our colourful children’s indoor soft play area occupies space in the north aisle of the church and has 3 levels of play. We have a capacity for 40 children with an age range up to 12 years old, with a separate area for younger children. 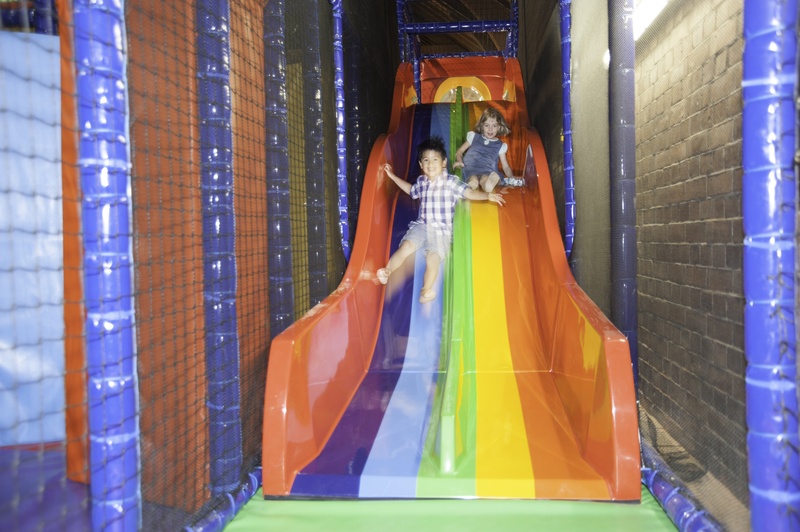 Children can wriggle their way around this exciting play frame, spy on their parents in the café via the hideout, crawl through tunnels, have races on the rainbow slide, use the canon ball to fire at a target, whizz down the spiral slide, and generally have all kinds of fun. Younger children can enjoy a ball pool, soft toys and interactive games and puzzles. Parents are welcome to sit in the café which is just across the church with a good view of the action within the play frame. Parents with children in the baby and toddler area must stay close in the seating provided. We have a Hullabaloo worker who is positioned by the entrance and exit to ensure children don’t wander off and to respond quickly and efficiently should there be a need. We are open Monday to Saturday, 9.30 am to 5 pm. We will also be open early on a Saturday morning from 8.30 am for those of you in need of a place to go with an early riser where you can grab a coffee to keep you awake! Discounts for 3 children, a 3 for 2 price will apply. The Saturday early bird price is £4 for entry which includes a cup of coffee or pot of tea. Hullabaloo is available for parties, occasions and private hire. We will be taking bookings for parties from September. More information will follow shortly on this. After a frantic few weeks, hence the blog silence, our doors opened on Friday 18th July at 1pm. 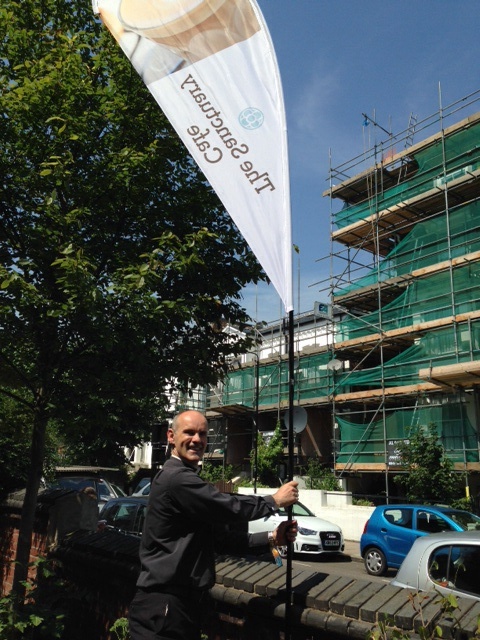 Father Andrew rang out the church bells to mark the occasion! We’ve been overwhelmed by the kindness, support and positive comments we have received and are so grateful to all who have helped us get here. We are open as a ‘soft’ launch for the next few weeks, to give us chance to iron out any problems or issues in time for our official launch on the 1st August. We are having an open day on the 1st which will see Glenda Jackson come to cut the Post Office ribbon at 11 am, Hullabaloo will be free for the day, the café will be showcasing many tasty delights and we will have all kinds of entertainment, including stilt walkers! The Post Office will be open as normal in order for everyone to go about their business. We do have a website that is currently under construction and will be live on the day of our launch, more details will follow on this as soon as possible. Main Office open 9 – 5, Monday – Saturday. Hullabaloo – Open Monday to Friday, 9.30 – 5, Saturday, 8.30 – 5. We bought a tent, a very large tent…but that’s a whole other story for another time, it may be genius it may be a disaster, it will certainly be different! It’s been an eventful few weeks and suddenly it’s almost been a month since our last post which is like a year in the pace of this project! We’ve been nonstop. Busily recruiting staff, setting them up with training and some pre-opening projects and tasks, the website is being designed, our logos are now done, we’ve been meeting with suppliers, panicking a bit, making lots of decisions, ordering more furniture , a bit more panicking and then very early on a quiet, beautiful June morning, Hullabaloo arrived…So far so good. We marvelled, we gasped and then we hit a bit of a bump that the design wouldn’t fit! After an anxious night, some measuring, negotiating and compromising we are back on track and looking forward to the first go on the rainbow slide! Work continues at a pace, and in a week of miserable weather it has lifted our spirits to see how it is all starting to come together , we can really see the Post Office in particular emerge. 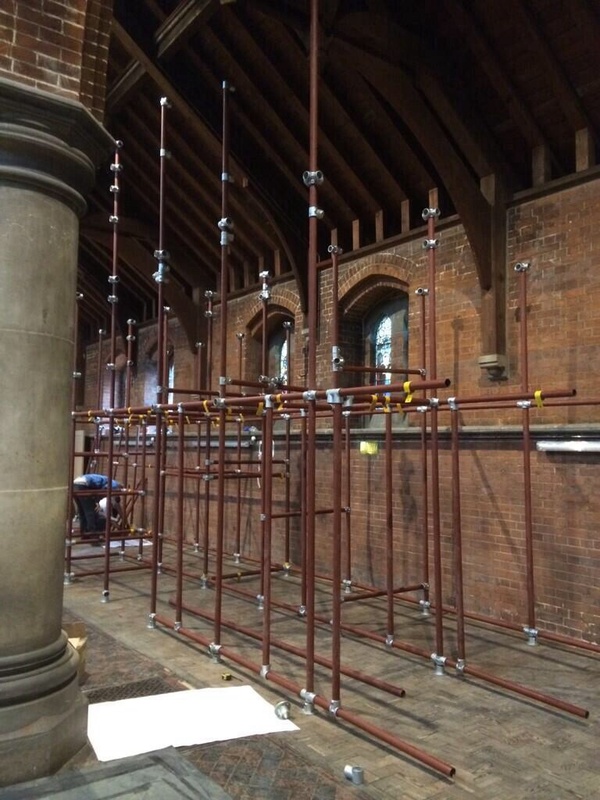 The lighting work is galloping along too and the church is looking spectacular with new lights illuminating the beautiful ceiling. Now the preparations and excavations have taken place work will begin next week to build the external ramp for disabled access. We’ve recruited some of our staff and taken a few interesting twists and turns in what we will be stocking in our retail area which we are very pleased about, more on that another time. 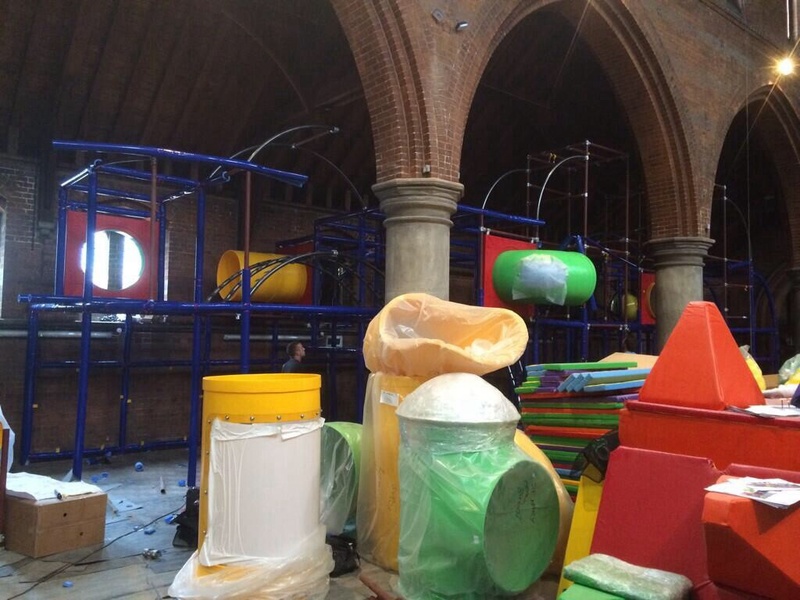 Hullabaloo, the children’s soft play, has a date set for installation and the design and logo are looking great! We’ve finally decided on café lighting over our seating area, our beautiful sofas have started to arrive to go with the lonely cushion that turned up weeks ago and we are looking carefully at our coffee supplier. We know how important this is, so plan to have a small tasting session with some of you locals who have a specific interest in the caffeine side of things! Watch this space on that one. Our hearts are pounding daily, as July approaches fast, and still so much to do but this is a real labour of love and we want it to be the best it possibly can be, something West Hampstead can be proud of, so we’ll crack on!